It’s innovative, sleek, and intriguing, just like the entire BMW line. But it’s also equipped with something special you won’t find in every BMW—a hybrid-specific combustion engine driving the rear wheels and an electric motor handling the front. It’s the 2018 BMW i8, a standout model that doubles as a plug-in hybrid luxury vehicle. In this BMW review, BMW of Westchester will take a closer look at this luxury car and delve deeper into plug-in technology. Explore this car and how it handles the roads of Westchester County, Yonkers, and Mt. Kisco by visiting our dealership today. The BMW i8 offers a dynamic drive, with power from an electric motor under the hood. There’s also a TwinPower Turbo gas engine located over the rear axle, which adds horsepower. The i8 Coupe and all-new Roadster achieve almost perfect 50-50 weight distribution with this setup. It’s easy to enjoy this innovative technology, as well. Energy will be repurposed while driving, so battery power can be restored on the go. If you’re looking to maximize charging potential, a Level 2 charger can be installed at home. Or, visit one of the 44,000+ public charging stations across the country, and charge the 2018 BMW i8 from 0% to full battery in just about three hours. If you know the BMW brand, you’ve come to expect a few things: grace, elegance, and also plenty of power. The electric motor and combustion engine combine to offer a total of 369 horsepower and 420 lb-ft of torque in this model. The BMW i8 Coupe is capable of accelerating from 0 to 60 MPH in just 4.2 seconds. BMW eDrive technology allows this 2+2 seater to travel up to 18 miles with purely electric driving. There are also four different driving modes to suit your driving mood. Standard COMFORT mode strikes that balance between sporty performance and fuel efficiency. The SPORT mode engages the combustion with an extra boost from the electric motor. ECO mode can be used in all-electric mode and blend mode. And, there’s the eDRIVE mode, purely electric with no emissions. The i8 is designed to impress. 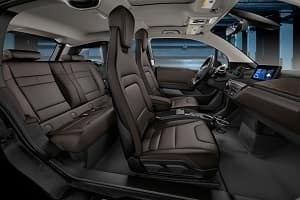 With the standard Carbon Fiber Interior Trim and each model upholstered in fine leather, both drivers and passengers will be comfortable on each and every ride. The standard heated front seats provide an extra bit of warmth on the coldest of days and nights, too. BMW Navigation comes standard. The interface includes a touchscreen along with natural language understanding for everything from maps to infotainment. Find your next route or choose a radio station and enjoy the tunes. The Head-up Display, meanwhile, can provide valuable driving info on the windshield. When driving in SPORT mode, the display will provide a shift indicator, gear indicator, and speed readout. Now that you’ve read about the 2018 BMW i8, get up close and personal with this luxury vehicle at BMW of Westchester. We’re always happy when Westchester County, Yonkers, and Mt. Kisco drivers get excited about their car, and this is certainly one to get excited about. Schedule a test drive with our sales professionals today. Have any questions? Don’t hesitate to contact us!